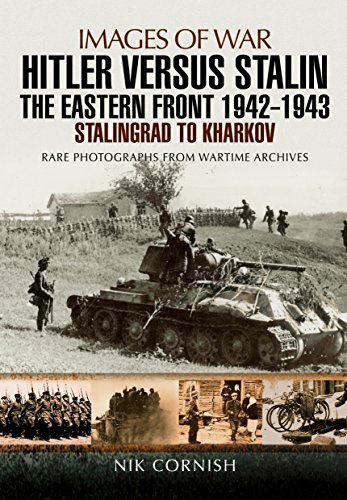 The second year of the Second World War on the Eastern Front was dominated by Stalingrad, the protracted battle for the city on the Volga, and this is the major episode in this volume of Nik Cornish's four-volume photographic history of the conflict. Stalingrad was a turning point in the war, the moment when the Red Army seized the initiative and threw back the German invaders. But the struggle at Stalingrad was far from the only focus of the fighting during 1942 and 1943. German forces conquered the Crimea, besieged Leningrad and advanced deep into the Caucasus. The Red Army took the offensive, not only at Stalingrad but at Rzhev, Kharkov and Kursk. So this phase of the war between Germany and the Soviet Union saw dramatic changes of fortune, offensives and counter-offensives on a massive scale, and these events are also illustrated in these rare photographs. These vivid images show the front-line fighting, the troops and the conditions on both sides, but they also document the consequences of war for the civilians under German occupation and the devastation of the Russian towns and cities.